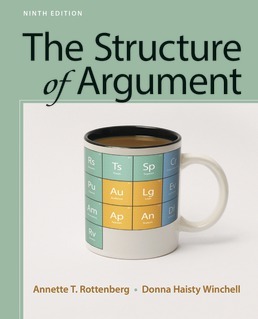 Breaking down an argument one element at a time, Structure of Argument teaches you how to approach, develop, and defend through a deep dive into the approaches to argumentation, critical reading, and argument analysis. A concise, but throrough text, you'll learn how each part of an argument--claims, support, assumptions, logic--are interwoven to create a persuasive position on a controversial issue. Added to this edition, a section of debates on unsettled current topics helps to enforce the importance of research and synthesis as you craft your own arguments. Mallory Simon, Gun Debate: Where Is the Middle Ground? *Justin Chang, Grace Shines Past the Emotional Manipulations of "The Light between Oceans"
Sid Kirchheimer, Are Sports Fans Happier? *Sunnivie Brydum, The True Meaning of "Cisgender"
Frank Deford, Why Keep Athletes Eligible but Uneducated? Jared Diamond, Will Big Business Save the Earth? Research Skill What Is Common Knowledge? *15 Rating Your Professors: Do Course Evaluations Matter? *Stephen Burt, Why Not Get Rid of Student Evaluations? *16 Trigger Warnings: Do College Students Need to be Protected? *17 Gender-Neutral Bathrooms: An Idea Whose Time Has Come? 18 Gender Stereotypes: Is the "Princess" Phenomenon Detrimental to Girls’ Self-Image? 19 Economics and College Sports: Should College Athletes Be Paid? Annette T. Rottenberg, formerly assistant director of the writing program at the University of Massachusetts at Amherst, has taught composition and literature at Chicago City College, SUNY at Buffalo, Duke University, and schools abroad. Donna Haisty Winchell has directed the Freshman Composition program and codirected Digital Portfolio Institutes at Clemson University, where she is Professor of English. She has edited several freshman writing anthologies—including Elements of Argument and The Structure of Argument for Bedford/St. Martin’s—and is a frequent presenter at professional conferences.